I love ttokkbokki, and to be honest, fell in love with it after discovering Korean dramas and how amazing they are. Korean dramas love to show great food scenes and every drama has at least one scene where the main characters go to eat spicy rice cakes. Characters always described ttokkkbokki as chewy, sweet, spicy, and very fulfilling. Needless to say, your mouth starts to water when you’re watching them gulp down all this delicious on screen. When I finally got to try it at Mom’s Tofu, a local Korean restaurant in my hometown of Fremont, CA, it was better than I had imagined. After coming home to Colchester, I had to make my own because we don’t have any Korean restaurants out here. 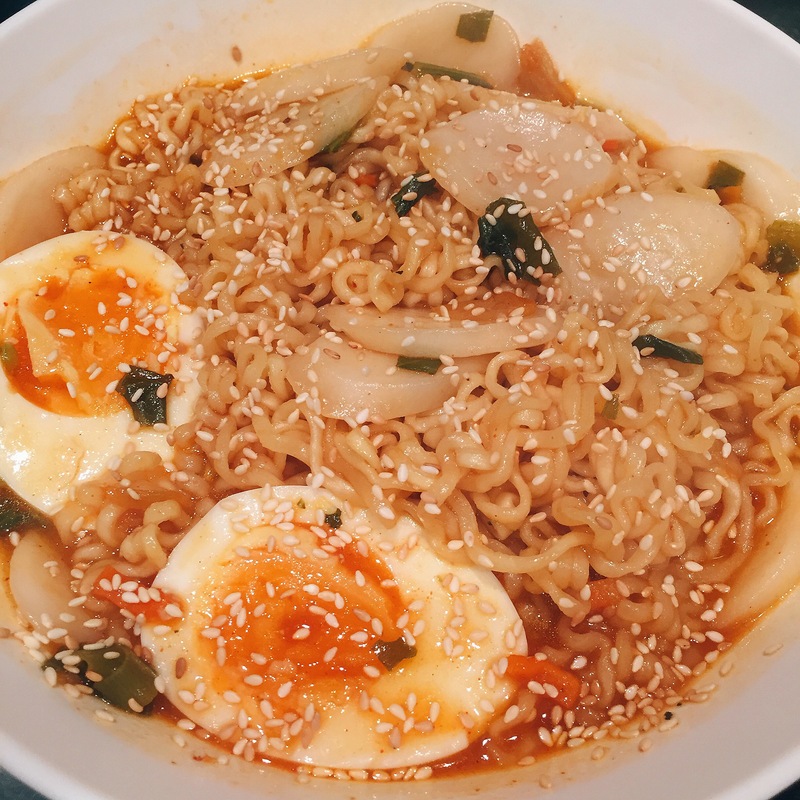 I’ve tried a few recipes here and there, but this is my favourite way to quickly make rabbokki (ramyun + ttokkbokki) at home. Note: you can make your own rice cakes at home, or buy different kinds. I buy a frozen one by Chil Kab that is sliced like a coin because I prefer that brand’s flavour and consistency over the other ones available. You can use whichever kind you prefer! I ran out of fish cake, but you should totally add it! Cook your egg and set aside. I like to cook mine by placing my egg directly in boiling water for 7 minutes. That way it’s still orange in the middle, but not runny. Measure out a bit more boiling water than the instructions ask for in a medium sized pot. Add rice cakes, kimchi powder and vegetable packets from ramyun, sugar, red pepper paste, fish cakes, and boil for about 10 minutes on medium high. Allow the rice cakes to cook nicely so they become soft and chewy. Add ramyun noodles and mix, cook for about another two minutes, then serve with your boiled egg sliced in half. Make sure that you don’t over cook the noodles, or else it won’t be as yummy. Optional garnish with green onions and toasted sesame seeds. Enjoy by yourself or with friends. I personally like to eat it while watching a nice K-drama when I finally have time to myself. I heartily recommend the ongoing Rom-Com, Strong Woman Do Bong Soon, because it’s hilarious and Park Hyung Sik is ridiculously gorgeous. I mean, look at him. Ugh. So beautiful.